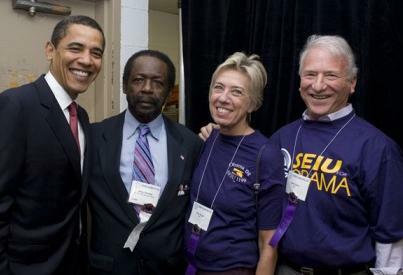 Well, we do wonder why SEIU is not Standing in Solidarity with SEIU Local 73 Chief Steward Joe Iosbaker in the FBI Terror Probe! Hell, quick-quitting and vanishing SEIU Mandarin -former SEIU President Andy Stern - the Media's Main Guy, is being probed -God I hope so -by the FBI for Corruption! Corruption, Boys and Girls! Mr. Class WarFare? Get This!!!!!! Give the Man his day in court . . .by all means! People interviewed by federal agents report the FBI and the Labor Department are investigating prominent labor leader Andy Stern as part of a corruption probe involving the Service Employees International Union. Two organized labor officials met with federal agents this summer to answer questions about Stern's role in approving money to pay the salary of an SEIU leader in California who performed no work and a book contract that Stern landed in 2006. Both officials spoke on condition of anonymity because of the sensitive nature of the investigation. The FBI and the Labor Department's office of inspector general declined to comment for the record. Stern abruptly resigned as president of the 2.2-million member SEIU in April. And, irony of ironies, I got this from NPR! Go figure! Andy was up to his purple pockets in the Blagojevich scandal too, but then President Obama's guy to fix the National Deficit took a Murphy from the public view -most abruptly. Some folks think that I am just a tad cynical. Just saw this on drudge...figured you'd be all over it...wonderful picture.